Reading materials for people of all ages are now available at four Metro Transit centers, putting surplus library books in the hands of riders in North St. Louis County. The St. Louis Development Economic Development Partnership, St. Louis Promise Zone, St. Louis County Library, Bi-State Development, Metro Transit as well as special guests, joined this morning at the North County Transit Center to launch the new community library box program for transit riders. The project is designed to encourage people to read, while also making the transit experience more enjoyable on MetroBus and MetroLink. The boxes are stocked with novels, non-fiction, children’s books and magazines that transit riders can borrow and read while they commute on MetroLink and MetroBus. Borrowing one of the books is easy. No library card is required, and there are no costs, no fines and no due dates to worry about. 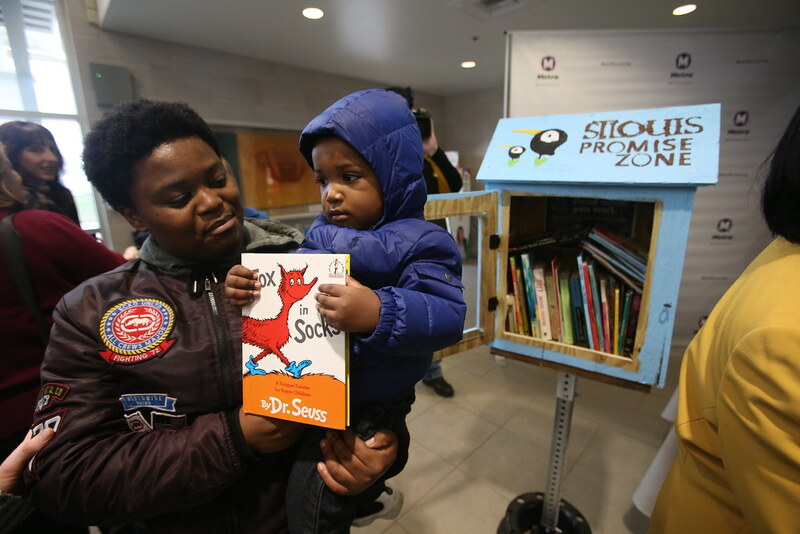 Borrowers are simply asked to return the reading materials to a community library box when they are finished, whether that is two days or two weeks later, so that other transit riders can enjoy reading them. The community library boxes are being supplied by materials from St. Louis County Library through its Recycled Reads program. Recycled Reads circulates surplus library materials at various locations throughout St. Louis County to make reading more convenient and accessible for those with busy schedules and limited time for recreational reading.